My work in progress novel finally has a beginning, middle, and end! That’s right, I finished the first full draft. I am so excited about this new writing milestone. I’m currently sinking my teeth into the editing and refining process. Can’t wait for everyone to read it. Stay tuned for more updates! Today, I reached a milestone in the writing process for the first draft of my second novel! So far, I have reached the checkpoint of 200 Pages, 65,503 Words, and 28 Chapters! I am so excited and cannot wait to share the entire finished book with everyone. Until then, I’ve got to keep writing! 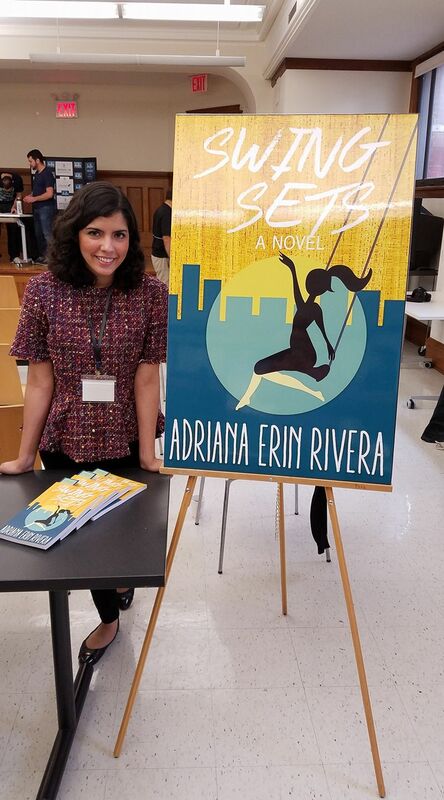 In October, I participated in Indie Authors Day in Brooklyn at the Public Library. It was a great experience. I met some fantastic writers, shared experiences as writers, heard great writing and publishing advice, sold some books, and had an overall wonderful day. The NorthBrooklynNews.com chronicled the day, took some photos, and included a photo of me reading an excerpt from SWING SETS in an article. I didn't know that there was an article until yesterday when one of the authors, Richie Narvaez, who also participated in Indie Authors Day, sent me a tweet about it. This is my first mention in the press as a writer. I'm very excited about it! This is just the beginning. I just started a new blog on Medium.com! My first post is about brands and how they are strategizing to get to the top of their respective industries in 2017. I call this strategic competition the "Running of the Brands." Give the blog a read and please share it with your friends. Spread the word. SWING SETS is Now a Kindle Ebook and MORE! You heard right. SWING SETS is now available as a Kindle ebook!! In addition to the paperback edition, my debut novel is joining the digital age. The book is available for purchase in both forms on Amazon. It is also available in paperback form through Barnes & Noble's website. Some more great news: SWING SETS is on GoodReads.com. It's another way to support the book with reviews, recommendations, etc. It's literally a literary social media network. So if you happen to be on GoodReads, add SWING SETS to your favorite books and help spread the word. I'm on GoodReads as an author as well, so feel free to check that out. More good news to come! Spread the word and Stay Tuned!! The Catamaran Literary Reader, a literary magazine based in California, wrote a review of "Swing Sets" and I could not be more thrilled! They wrote a glowing review that really captures the essence of the book. I am so thankful for their kind words and I am glad the book is translating well to readers. The Barnes & Noble at the Fashion Institute of Technology in New York City is hosting an author event for my debut novel, "Swing Sets." It will take place on Thursday, February 19th at 5pm. Think of it as a Literary Happy Hour on a Thirsty Thursday! I hope you'll come and join me for the book signing and reading. The details are in the graphic. The Latest on "Swing Sets"
My debut novel is up on GoodReads! Now you can check out the book and become a fan of me and "Swing Sets." In addition to being sold on Amazon, you can also get your copy of "Swing Sets" on Barnes & Noble online. My book signing event is still happening on Saturday, October 25th from 5-8pm at Symposia Bookstore (510 Washington Street, Hoboken, NJ). I'll be signing copies of "Swing Sets" at the event as well as reading an excerpt from the book. The best support you can offer is when you actually go and buy "Swing Sets." Please order your copies of the book via the links above and don't forget to become a fan of the book if you're on GoodReads. And I hope to see some new and familiar faces at the book signing. "Swing Sets" Is Now On Sale On Amazon.com! My debut novel "Swing Sets" is now available for purchase on Amazon.com! The other day, I got the first proof for my novel! I got the email in the morning and I knew I couldn't check what it looked like until the evening so there was serious excitement, anticipation and high expectations throughout the day. I am so happy about how it turned out. The pages are so pretty! Countdown to the on sale date, you guys. It's really happening and the goal is to release the book on Amazon.com sometime near the middle of September. Look out for it! I started a new blog to discuss the step-by-step process of getting my book published. It's on WordPress. I invite you all to check out my new blog and if you are a member of the WordPress network, please connect with me. So far I have posts about finishing final edits, collaborating on cover art, and the challenges of hiring a publicist. I will still write updates on what's going on with the book and post the link to purchase it when it is published. I just started working with an amazing illustrator to help me bring the major images in "Swing Sets" to life for the book cover art. The creative ideas are flowing and I'm finding a lot of really great inspiration. I have good feelings about this! I feel like I'm taking a trip back in time to art class or something, cutting out pictures and figuring out how we can translate the essence of the book on the cover. Expect lots of color! I got great feedback on my manuscript from a trusted, professional writer! That means some more edits on the book, getting cover art created, and publishing the final product to share with everyone. I am so proud of this project and I can't wait for readers to enjoy the finished book. I'll keep updating with new developments. I finished the first draft of my first novel this week! This is a huge milestone for me. Writing this story has been such a thrill for me and I can't wait until I can share it with everyone. I hope you'll all fall in love with the characters I've created as they have been living in my brain for so long. We are one step closer until the finished novel is available for you all to read, but I'm counting on you guys to be patient and supportive as you have been thus far. Yay!!! First Draft of My Novel is Almost Done! I'm in the home stretch at this point in the process of writing my first novel. It's been my special project for about a year and I cannot wait to eventually share the finished product with everyone. There's still more work to do before that time comes, but for now, get excited!